Q: What does TopKit do for Clubs, Teams or Events? A: We help you decide what items are offered. You may link to your corner of the shop through your own site or page or distribute the link as you wish. Customers will order and we will fulfil those orders. If you have a special event or promotion we can also do short-term offers for you. 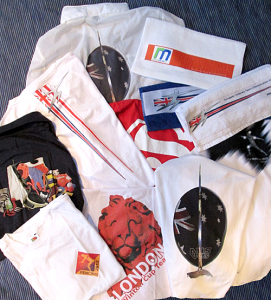 Q: Lots of people seem to offer customised apparel, what makes TopKit different? A: Our support and service makes our business model different from those who want you to do all the work of collating and distributing orders. TopKit understands that you are proud of what you do and would love others to feel equally proud by wearing quality clothing bearing your message. TopKit also understands that organising and offering such things is time consuming and a distraction from your core work. Our core work is organising and managing the development and sale of branded merchandise on your behalf. Together we can help you get your message walking around on chests, heads, arms and backs! Our in-house designer has created many unique images and designs for ranges of products and is also available to advise on your own images to achieve the best production outcome for your products. Q: Do I have to collect the orders and money from colleagues/members before I place an order? A: No, we will finalise the details with you and then upload the items into our shop. You simply direct everyone to the shop and we will look after the rest for you. Q: How long will it take to get my/our items into the shop? A: It costs you absolutely nothing to get started. Where TopKit is going to be selling items, the design support is provided for free. We will work with you to select a range of items that are only bought and printed or decorated when we receive an order. Q: What is the risk? A: The biggest risk is having your competitors selling their branded merchandise to people that might have bought yours! Because we structure the business the way we do there is no stock being held by you, no involvement by you with specific orders and no financial risk. Because we only produce to order you can experiment with what you offer with no risk – if it sells that’s great, if it does not sell we can remove it and try something else! Q: How do I choose what to offer? What sells best are clothing items that are current and tasteful – or useful! – so people want to buy and wear them. There is an enormous range from organic cottons to heavy weather gear, so it can be whatever is most appropriate to your members or clientele. TopKit has experience with many clubs, teams, organisations and events to assist you to make a selection of products to offer. Remember, there is no risk because you are not investing in any stock. Q: How long will people have to wait to get their items? A: We will dispatch orders within 10 working days – often within 5 working days of receiving your order. Because we use various processes to produce the range of items we offer, delivery times vary – for instance, if there is a high level of personalisation then it takes a little more time. Exception: items like tracksuits, jackets and team items sometimes need to be ‘batched’ before orders can be fulfilled, particularly those that are manufactured to bespoke garment design. Expected timing and arrangements for delivery are discussed with clubs or organisations before items are made available to members. A: You need to give us a little of your time at the beginning to agree on designs, garments and products. You also need to promote your items – for example on your website, page or communications by means of links, or to your membership/clients/participants. We will then accept and fulfil orders and keep you posted on what is selling. We may, from time to time, suggest new items and ideas and we are happy to work with others in your team when they have needs for a specific activity, event or promotion. Q: What does TopKit do? A: TopKit has developed its online shop to feature a broad range of custom and bespoke items with unique and original designs. TopKit creates designs and develops products for clubs, events, organisations and individuals world-wide. Products are offered through the online shop, printed or decorated for each specific order and distributed directly to each customer. Q: Do you personalise garments and other merchandise? A: Yes, that is an important aspect of what we offer – because each item is produced individually we can add names and other information specific to the person buying the item. Q: Can I have a TopKit design put on an item or on a colour that is not currently available in the online shop? A: Yes, we can be flexible. If it is achievable, we can make that item available online for anyone to purchase. Q: Will you provide items with my own designs? A: Yes, but we will reserve the right to advise you on changes if we think it might not work the best way for you. We want you to look and feel great so we will take an interest in giving you that service and support. Q: Is there a minimum order to have my own design created? A: No, you can buy one only if you want but there may be some cost depending on the work that has to be done by our designer. Q: Can I return an item if I don’t like it? A: Each order is produced specifically for the person ordering. If there is something wrong with the product we will happily replace it, but if you simply change your mind we cannot take it back or give you a refund. Q: Can I return an item if it does not fit? A: Size charts are provided so you can choose the size of each item. Each manufacturer produces their own size charts, and it is these that we use so the differences in manufacturing sizes (and these can vary quite a lot) do not create problems. ‘Medium’ is not always the same ‘Medium’! Each order is produced specifically for the person ordering. If there is something wrong with the product itself we will happily replace it but if you have chosen a size that does not fit we cannot replace or exchange the item, or extend a refund. We suggest that with those garments with size charts that refer to the measurements of the item (rather than those that use body measurements), you use a similar garment that fits to check the measurements are the same. Q: What is a half chest measurement? A: Place a garment flat, measure it across from armpit to armpit – this is the half chest measurement. This is also sometimes referred to as ‘width’.